Have you ever noticed how food, like clothing, is subject to the same endlessly cyclical tides of popularity? Have you seen how ingredients can languish in obscurity for decades, only to burst onto the scene again in such a chorus of fanfare you’d think they had just been discovered? Think of what was wildly popular a decade or two ago: I remember it like yesterday when everyone was getting excited about sundried tomatoes, heart-healthy sauces and ‘California Cuisine’. Bet you haven’t encountered any of these in a memorable restaurant meal recently. Now think of ponzu, verjus and viande sous vide. There doesn’t seem to be a cutting-edge chef in the world who isn’t playing with these in the moment, at least if Gourmet is to be believed. The funny thing is that as sure as dinner follows lunch, within another few decades people will be turning up their noses at ponzu and once again adorning their filet mignons with sundried tomatoes. This exercise in collective amnesia is nothing to lament, in opinion, it’s just the way things work in trends of all kinds, foods being no exception. Another good case in point is undoubtedly our recent obsession with squash blossoms. I could swear that up until a few short years ago, I had never so much as heard that zucchinis had blossoms, let alone seen them in food. People who grew zucchini or summer squash in their gardens knew that come summer they’d simply have a glut of vegetables that they’d have to unload on unsuspecting friends and neighbors lest they drown under the weight of this prolific crop. No one considered harvesting those little orange blossoms that appeared just before the squash and making dinner out of them instead. Some time during the last five years, however, squash blossoms have been ‘discovered’, and now it’s hard to ignore them. Squash blossoms are suddenly turning up in everything from fritters to pasta, salad to omelettes, soup to preserves. If you’re slightly less plugged in to the changing fates of foodstuffs you might be forgiven for thinking humans had just discovered squash blossoms are edible, which couldn’t actually be further from the truth. In fact squash blossoms have been adorning homosapiens’ dinner plates for just as long, if not longer, than their more famous vegetable by-product. Like all squashes, zucchini and summer squash are native to the Americas, and both they and their blossoms have been used extensively in indigenous Central American cuisine for millennia. You will still find the squash blossom making starring appearances in modern Mexican cuisine – it goes under the name flor de calabaza and finds its way into soups, quesadillas and salads, not to mention giving chiles and tortillas a run for their money as a favorite envelope for fillings. Interestingly enough, when the Europeans first observed the indigenous Americans eating squash, it was not the vegetables that caught their attention, but the blossoms. Soon after Columbus returned to Europe zucchini found their way to Italy, where they found instant popularity – as decorative garden plants, to be precise. Italians loved the vibrant and sensual blossoms these new plants produced, and kept them for ornamental purposes long before they discovered that any part of the plant was edible. Luckily for us, the Italians were intrepid gastronomes and soon discovered that just about everything the plant produced was edible – and went on to concoct a whole range of dishes showcasing the delicate and earthy flavor of the beautiful blossoms. Though slow to catch on in the U.S., squash blossoms are turning up more and more frequently on the hottest restaurant menus in the country. Unfortunately, they can be tricky to track down for the home cook because of the difficulty in bringing them to market – they’re just too fragile. In fact, unless you have a garden of your own, you may never be able to taste them at their absolute prime, which is reported to be within four hours of harvest. If you have access to a good farmer’s market, however, you’ll probably be able to get your hands on decent ones, which if you rush home and keep refrigerated will last up to a day. I was so excited by finding them at the Pike Place organic market that I didn’t hesitate to buy a huge sackful, imagining a myriad of exotic things I was going to do with them. What I didn’t do was stop to consider what eight hours spent in a backpack on a hot summer day would do. When I finally opened my bag at home that night I was dismayed to find that those poor blossoms were looking decidedly less crisp and vibrant than they had when I’d made my menu plans. Not to be completely defeated, however, I came up with a use for them that didn’t depend so much on their freshness – I made a fragrant and delicate cream soup that beautifully set off their spicy floral fragrance against the rich nuttiness of gruyere cheese. And while the soup was delicious, the most incredible thing was imagining how the taste of these trendy little flowers have been amazing people already for hundreds of generations – not a bad track record for the ingredient no one had heard of ten years ago. So get ahold of some squash blossoms while you can – no one known when the winds of fashion will blow them back into obscurity. But even if you miss them this time, they’ll undoubtedly be around again – and as long as being fashionable is so delicious, I’m more than happy to wait for their return. Prepare the blossoms by cutting off the prickly stems and removing the yellow pistils from inside each flower. Chop coarsely. In a large heavy pot, sauté the diced onion and garlic in the butter over medium heat until the onion is soft and translucent but has not started to brown. Stir in the chopped squash blossoms, and sauté for a minute or two until they wilt. Stir in the stock, and let simmer for about 20 minutes, until everything is soft. Puree the mixture, either by using an immersion blender or in batches in a blender. Return the soup to the pot and stir in the cream and gruyere cheese, and season to taste with salt and pepper. Keep warm without boiling until ready to serve. For garnish, combine the ricotta with the parmesan and herbs. This part can be done in advance. Just before serving, stir in the pine nuts so they don’t get soggy. Season the mixture to taste, and stuff each of the reserved whole blossoms with a spoonful of the mixture. Float the blossoms on the soup and sprinkle with chopped fresh herbs. Serve immediately. Note: This soup is also excellent cold. WowThis looks fantastic Melissa! I am definately making this when we are overloaded with the flowers later in the year! Great picture, Melissa! I noticed the same phenomenon with roquette (ital. ruccola) which is a very old herb in Germany (known under the name of “rauke”). For ages only very special farmes cultivated ruccola. Today you can hardly get a salad in a restaurant without it. Lovely post, as always, Melissa! Looks like I may have to run down to Pike Place on my lunch hour…Thanks for a beautiful recipe, m’dear. Dear MelissaWhat a fabulous post. Here in Singapore, zucchini flowers are as hard to lay your hands on as haute couture. Each one comes nestled in its own little bag. O, how I envy you for having bought a sackful! Hi Clare – Great, I can’t wait to see what you do with them!Hi Claudia – That’s very interestng. I’ve seen plenty of ‘rucola’ on restaurant menus in Germany, but never ‘rauke’ – who would have known that Italians can’t take all the credit for discovering it!Hi Angelika – Welcome and thanks for your kind words! Your blog is lovely and I look forward to spending some more time there finding out about food in Austria, a country I’ve never been to!Hi J – Thank you, thank you! I actually checked out ‘At Home in Provence’ from the library as well, and have a few of the recipes copied down, and overall I think they look much more enticing than the Paris Cookbook. Thanks for the recommendation – it’s a cookbook I definitely want to get!Hi Molly – Happy to oblige! 🙂 And if you’re planning a lunchtime market trip, definitely go on Wednesday – that’s the day you’ll find the organic sellers with their squash blossoms and their *peaches* (can you see the drool? )…Hi Paz – I know you were waiting for this! 🙂 Do try to find squash blossoms at a local farmer’s market – they’re in season right now and shouldn’t be too expensive. And those leaves are fresh herbs – oregano and thyme, to be exact. Hi Melissa – such a beautiful and inspiring recipe as always. Do you think I can make this without gruyere? Hi Melissa — we’re just back from our own vacation, so having finally posted again, I’m catching up on blog-reading. As always, you leave me breathless with your beautiful photos, entrancing descriptions and lush recipes. Even though I’m not in Seattle, I have to get me to a farmers’ market asap! My dear Melissa! What a lovely and fresh looking photo. 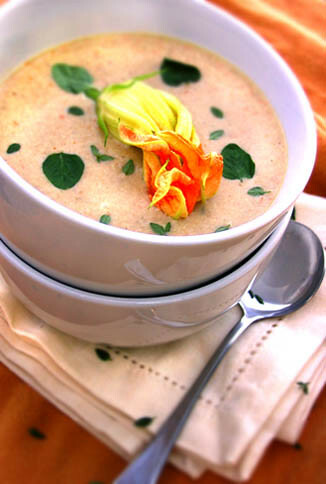 I’ve only had stuffed squash blossoms, so the idea of this soup is rather intriguing. How would you describe the flavour? Melissa, so pretty! If I officially adopt you as a sister does that mean that you will visit me and cook for me too? I can’t imagine how much your family will miss your culinary successes after you return to Edinburgh! Beautiful recipe yet again.. I just started perusing your blog (thanks to Saveur 2011 blog awards) and I was very happy to come across this recipe. I've been transplanted from the U.S. to Mexico City, Mexico and the differences in ingredients available is astounding. Squash blossoms are plentiful here and used in darn near everything. This is a much more dressed-up and sophisticated Squash Blossom Soup than what they serve down here. The biggest bonus is that all of the ingredients are readily available (with only the gruyere being uncommon and a tad expensive). I can hardly wait till the market opens tomorrow and I can start cooking what is sure to be a delicious soup!